This article is a “part-two” to the previous article “U.S. Policy Toward the Levant, Kurds, and Turkey,” which warned that the United State’s decision to back Kurdish nationalism in Northern Syria in an uncompromising fashion would provoke negative consequences. The push-back against this policy has begun. Turkey’s invasion of Afrin and campaign against the YPG—the U.S. backed Kurdish militia in Syria—is being launched to counter Washington’s decision to stay in Syria and arm and train a Border Guard for the emerging North Syrian state that the U.S. is sponsoring. 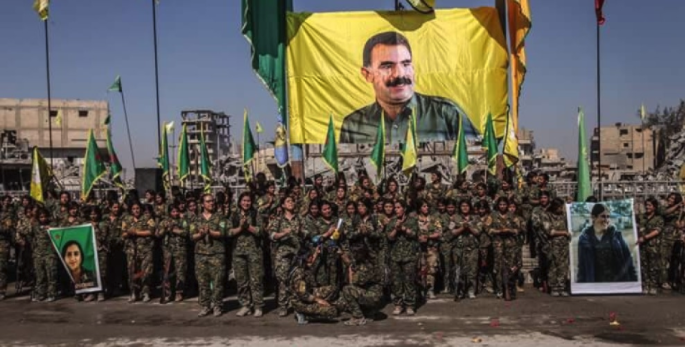 YPG Command Nesrin Abdullah said they dedicated the Raqqa victory to Kurdish People’s Leader Abdullah Öcalan and all the fighters who lost their lives during the liberation campaign. Turkey, Syria, and the Kurds must be aided in coming to an understanding that will promote stability; the U.S. can broker this and help to guarantee it. In this arrangement, neither Turkey, Damascus, nor the Kurds will gain everything they want, but all three will get more than they now have. Already in places like Hasakeh province in northern Syria, the Syrian government and Kurdish authorities have worked out and respected revenue sharing deals for oil exploitation that have been in effect during the civil war. A very well thought out and informed analysis. The American policy in Syria hasn’t proven very coherent, much to the detriment of the region’s people. It was unfortunate to hear American officials state that they had no plans to help rebuild the areas liberated from ISIS. The authors offer alot of possible paths for a resolution of Syria’s current predicament, and all of them depend mostly on how strongly the Kurds want their own state in the North of Syria. It is hard to imagine the Kurds willingly giving up what they have gained to accommodate the region’s powers. Exactly how does the U.S.A, government become an “HONEST” broker after all this war and destruction that it has overseen? Looking around the MENA since 9-11, to the ongoing scenarios today, with no end in sight it seems, as pointed out in the post, at some point down the road, it will pull out, then what? If the Kurds are allowed to control the swath of land they hold, how will the rest of Syria recover? It might be doable if the U.S. was dealing from a position of economical strength at home, but the only strength is at the end of a gun barrel, one that it is having trouble maintaining. Perhaps if the U.S. retreated, quit trying to change other countries in its distorted image, left Israel/Saudi Arabia to float on their own without the U.S. Military, the wanted peace might be achieved along with other changes in attitudes. Regardless of what others want to say, Syria is at the crossroads because of failed objectives by outsiders. “February 24, 2018”??? Not yet! Thanks Juan. Not sure how two authors missed such an obvious typo. Expect the US to do exactly the opposite of everything Landis recommends. The obvious fly in this American Exceptionalist blueprint for the Mideast is that it relies on the assumption that the U.S. is justified for even being there. The U.S. involvement in the Mideast has, since 9/11 (and before) been illegal and in contravention of international law; not to mention based on lies. Boiled down, this essay reads: Let ’em all alone to sort out their issues with the U.S. withdrawing hegemonic sanctions and insuring unimpeded economic development; even assisting. Had we followed this plan, millions would still be alive, 10’s of millions would be living in their homes and pursing their occupations, and Europe would not be in chaos. Boiled down further it should read: The U.S. should get the f**k out of the Mideast. Naturally though, the degree of Zionist influence in our government and their adherence to the Yinon Plan and dreams of a ‘Greater Israel’, and the demands of the fossil fool industry, precludes rational actions. These are the issues to which this essay should be addressed. This article is a great distortion of the facts. First there is not something like ‘The Kurds’. Who in the first place is a Kurd? for instance what about those of mixed marriages? Secondly and most important, Kurds are a very diversified people, whether by language, religion, politics, cultural and economically. The PKK/YPG for instance has been liquidating other political parties in the region it controls. Joshua Landis always talks about ‘The Kurds’, while he should be speaking of the PKK/YPG. The YPG is just a subsidiary of the PKK and this knowledge is needed to understand Turkish behaviour. Turkey knows pretty well the plan is to carve up Turkey as the endgame. Third his advice for the US government is a laugh. Ever since the first settlements in America this colony/country has always been bullying and bribing its way to establish control. His request is therefore like asking Hitler to save the Jews. He also omits the fact the PKK is officially a US designated terror group and those aiding it, as the US government does, should be jailed. So this whole lot running Washington have to be thrown in prison. Also the Us should be obliged to repair the damage done in the region. Those who break things should repair it. Very simple. A very interesting analysis as always. I have a major objection though : it seems to me that all your article is based on a false assumption. You say that “Turkey, Syria, and the Kurds must be aided in coming to an understanding that will promote stability”. I don’t see this any understanding coming from Turkey and, though to a lesser extent, from Damascus either. 1. Turkey refuses to recognize the Kurdish language in Turkey not to mention any form of administrative autonomy and it has been like that since the beginning of the Republic. Their refusal of any form of Kurdish autonomy in Syria or elsewhere is just an export of their refusal at home and it will stay like that, whether you have the Kemalists or the Islamists in power in Ankara. 2. As for Syria, the regime has to hide its Alawite core constituency behind a smoke of Arabism or Syrianism which makes it adamant in refusing any political recognition of the Kurds. Maybe the Russians will force Damascus to swallow some sort of Kurdish autonomy, but considering the criminal nature of the Damascus regime, who could trust them ? The Kurds are in a zero-sum game with Turkey and it’s Turkey which has set this rule. At the moment, the Kurds can only rely on the American alliance to get the maximum of recognition of their legitimate national rights. Nothing will mollify Ankara, except a total political submission of the Kurds. But you’re right, Kurds have absolutely no certainty that this American support will last. They just don’t have any other choice. One should consider the PKK/YPG to be bloody fools for following US requests. They were promised heaven and more on earth and will finally end up like Barzani with hardly anything. Serves them right. How stupid must one be after all what’s happened in the Middle East to believe one word coming from Washington? Ever heard of what happened with the Sjah, Saddam Hussein, Saleh and Moebarak? To WILLY V D , you forgot Gaddafi, especially after the U.S. got his Nuclear stuff. Turkey did not attack the Kurds until it received a green or a greenish light from Russia. When somebody has US support you can bet Russia will do anything to undermine that support. Damascus does not want Turkey in but it got nervous after seeing what the US was trying to do. The Kurds will be left in the cold unless they agree to attack Iran or do more for Israel. A huge miscalculation by the Kurds who are now asking for support from the Syrian army (!! ), they, the Kurds, are not a match to the Turkish army but they can inflict damage on Turkey in and outside Syria which would be a desired outcome if you ask Assad. 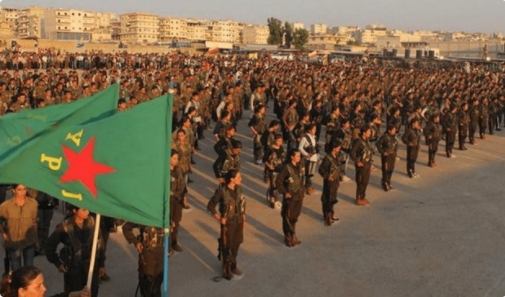 Keep in mind that the Kurds in Syria are mostly outsiders and as a group they have limited connection to Syria historically and culturally and their 5 folds increase in numbers as a % of the population in the last 100 years is mostly due to Turkey’s atrocities and illegal immigration. I agree that the US is unlikely to do anything constructive in Syria and may just leave the Kurds to fight a war they did not need. Eugene, Kadhaffi never was a friend of the US. After taking power he chased out the US and UK and they never forgave him for that. To WILLY, I didn’t say he was, but then, the PKK is a terrorist designated group now, isn’t it? My point, the U.S. took the Nuclear stuff, because Kadhaffi didn’t want to suffer what Saddam did. Too bad he made that bet and lost, which the PKK/YPG should take notice of. Looking at the MENA today, how long can this destruction go on? Eugene. Of course you’re right. Well this destruction has to do with the zionist wishes laid out in the Odet Yinon plan and the fact the US works under command of Israel. So who knows how long. But they are losing big in Iraq, Lebanon and Syria. To end on a positive note. One small disagreement on the USA’s interests. Prof. Landis argues that the USA is interested in peace in the region. The recent history shows that, either the USA government does not know where its interests lie, or it knows perfectly well where its interests lie and that they lie elsewhere. My guess is that this second option is right. The USA’s interests, as they are expressed by this and the past governments are in the destruction of the Middle East, in order that the two only survivors of this massacre, Israel and Saudi Arabia rule supreme in the region. An additional interest of the USA government is in the sale of weapons, and that is achieved by a forever war better than by peace. So, preventing Syria and Iran from rebuilding, fanning conflict with the Kurds and keeping everyone, except for Israel and Saudi Arabia poor and discontent is in the USA’s interest — as interpreted by the USA elites. Rebels have just created another enemy to serve the interest of erdogan and turkey with the hope that they will be given permission to establish a mini government in areas that fall under Turkish control, this strategy, if you want to call a strategy, will further alienate those rebels who now decided that going to Russia is not in their best interest as long they find support for their effort to keep this war raging until something is changed in their favor. Short term gains, assuming that those gains can be sustained, wil be inadequate unless erdogan outmaneuver Putin which is a big gamble. The outcome of this new adventure will be largely decided by the price Russia will get for allowing turkey to stretch its military muscles. Assad is not saying much about this because he is not in control and he is not ready to open a new front until the Kurds take off their us-made uniform and follow Damascus orders. Russia sees no benefit of supporting the Kurds who are seen by the Russians as US agents today. It not certain who will prevail here but it is very likely that the biggest losers will be the Kurds who overestimated the willingness of Trump to stand by them. Landis! You crossed with your choir an acute angle to the Turkish camp / practice chameleon/against the Kurds just because you become know that Donald Trump is about to turn victory over ISIS into defeat just because he has business dealings with Erdogan,ISIS and Al Qaeda affiliate, that US intelligence services are concealing. What about long-term interests of multiple countries of interrupting the Shi’a Crescent toward Hezbollah? That is a huge distortion of territorial sovereignty and great threat toward human rights and peace in Syria, Lebanon, Israel, and Jordan. 1. Do as Joshua and Matthew advise or the “Adults in the Room” measure. 2. Do the bidding of the Israel/Saudi bloc and invade Syria outright. 3. Make a stand and face down Turkey in the hopes that they won’t dare cross certain lines in the sand if for nothing else to make a statement about “Who’s The boss.” Losing face because of threats from a second rate power is “a non-starter.” They will defend their plan. 4. Pull out support for a Kurd dominated region in Syria. I pick an extremely likely door number 2. With a possible but unlikely number 3. It’s good to see Joshua and Matthew actively participating in the discussion. This thread reminded me of the first two years of the Syria war when this site was buzzing with all sorts of participants from all backgrounds, ideologies, sects, views, and secret service agencies. I honestly hope that 2018 is the year to stop this war.